I wasn't really sure I would use Charlotte Tilbury Hollywood Flawless Filter often enough to justify the cost, but after using it one day - I was hooked. 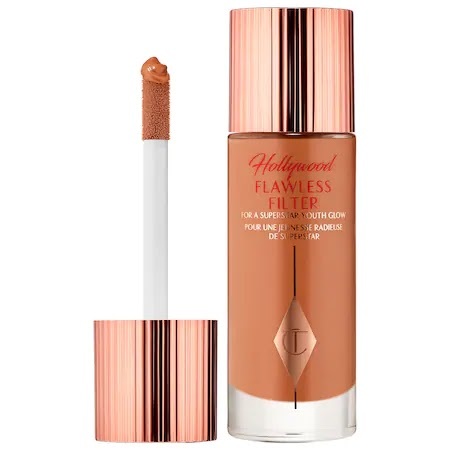 Charlotte Tilbury Hollywood Flawless Filter is a 3-in-1 skin product which can be used as a primer, highlighter and foundation booster for when you want a glowy (not shiny!) finish. It gave me the perfect dewy finish/ or glow, depending on how much I used and in what way. Even better, it has light reflecting particles which give a soft focus effect to make lines, pores and discolorations look less prominent. I used Charlotte Tilbury Hollywood Flawless Filter 7 Dark which was a good match (and this is the darkest shade currently). However it will work for a variety of brown skin tones, since it's not meant to match skin like a foundation. There are 7 shades in the line. I loved how sheer and lightweight Charlotte Tilbury Hollywood Flawless Filter 7 Dark felt on my skin. When I used it as a primer or just over bare skin, it gave me a beautiful glowy finish, which didn't make my t zone look overly oily. It looked natural because it was a light wash of highlighting but there was no glitter or large pieces of shimmer in in the liquid. I would also use Charlotte Tilbury Hollywood Flawless Filter mixed with a lightweight moisturizer on days when I was drier, or knew I would be traveling and in dry air conditions. Used this way It kept my skin looking hydrated and healthy with that beautiful glow. Charlotte Tilbury Hollywood Flawless Filter 7 Dark can also be used as a traditional liquid creme highlighter, and I liked using it on the high points of my cheekbones, brow bones, tip of nose and center of forehead after applying a natural/satin finish foundation. Charlotte Tilbury Hollywood Flawless Filter was easy to blend and I found a little went a long way. I applied it using either the end of the sponge applicator or a small beauty blender.